Ophelia the perfect model in her fairy dell. 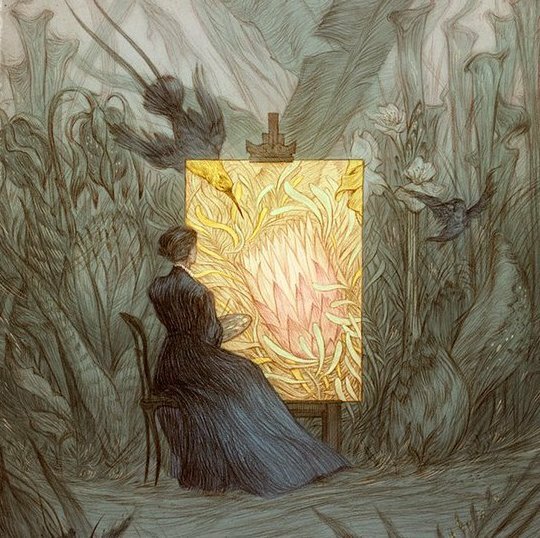 I am taken by my kind host around his garden, and shown, among other things, a flower, an orchid, that catches and feeds upon live flies. It seized upon a butterfly while I was present, and enclosed it in its pretty but deadly leaves, as a spider would have enveloped it in network. 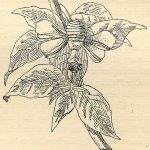 A beautiful drawing of this rare insect, Hymenopus bicornis (in the nymph or active pupa state), was kindly sent me by Mr. Wood-Mason, Curator of the Indian Museum at Calcutta. A species, very similar to it, inhabits Java, where it is said to resemble a pink orchid. Other Mantidae, of the genus Gongylus, have the anterior part of the thorax dilated and coloured either white, pink, or purple; and they so closely resemble flowers that, according to Mr. Wood-Mason, one of them, having a bright violet-blue prothoracic shield, was found in Pegu by a botanist, and was for a moment mistaken by him for a flower. Alfred Russell Wallace and drawing of nymph of “Hymenopus bicornis in active pupa stage” by James Wood-Mason. The orchid mantis was later featured in a number of books and articles on animal coloration (Wallace 1877; Wood-Mason 1878; Wallace 1889; Poulton 1890). 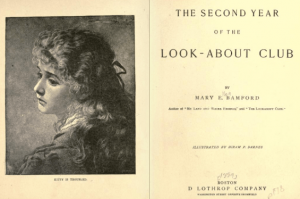 America author Mary Ellen Bamford (1857-1946) featured the orchid mantis in the sequel to her children’s book The Look-About Club (1887.) Bamford’s series documented “the curious live things” found by a precocious group of young girls smitten with natural history. Papa told me some funny things about the mantis. He said that in Java there is a kind of pink mantis that, when it sits still, looks just like a pink orchid-flower. Papa said that this mantis likes to eat butterflies, and the butterflies suppose that the mantis is really a flower, and so they come near it and are caught. Colour, form, and attitude all conspire, in an inimitable manner, to produce the resemblance. Of the meaning of the resemblance there can be no doubt. Insects seem attracted to the mantis, as insects to flowers ; they settle upon it, and are instantly captured. 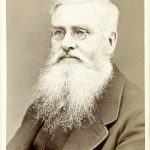 Alfred Russell Wallace’s initial theory has only recently (Hanlon & Rashid: 2013) been further investigated. The assumption that the orchid mantis’ morphology functions as a form of mimicry implies that the orchid mantis is cognitively misclassified as an orchid. 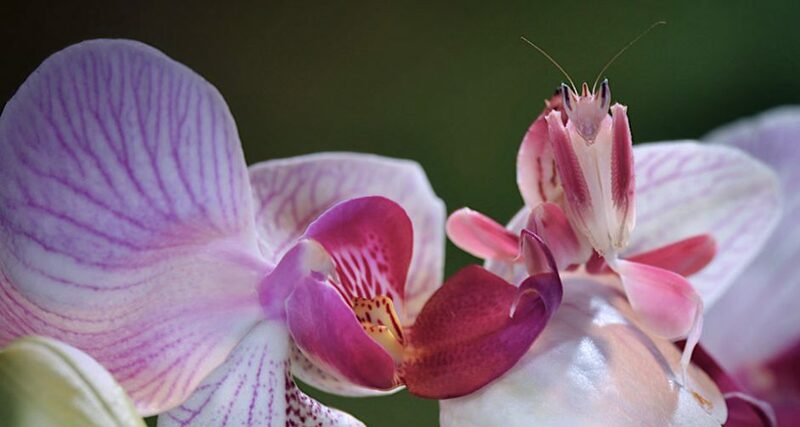 However researchers recently concluded that the shape and color features of the orchid mantis’ body does not converge upon a specific flower. Using spectrometry to measure their overall coloration geometric morphometric techniques, researcher’s concluded that the mantis was seen by its prey as an approximation of various flowers. They have also been proven to attract more pollinators (per hour) than a number of control stimulus flowers. ( Hanlon et al: 2014) This predatory strategy ensures that the mantis does not discriminate its prey – attracting all manner of pollinators – into its waiting jaws. Bamford, M. E., & D. Lothrop & Company. (1887). The Look-About Club, and the curious live things they found. Boston: D. Lothrop Co.
L. N. Badenoch, True Tales of the Insects, Dutton, 1899. 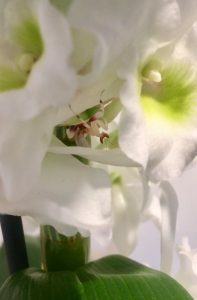 ‘Coloration and morphology of the orchid mantis Hymenopus coronatus (Mantodea: Hymenopodidae)’, J.C. O’Hanlon, D. Li and Y. Norma-Rashid, Journal of Orthoptera Research, Vol. 22, No. 1 (2013), pp. 35-44. J.C. O’Hanlon, G. I. Holwell, M.E. 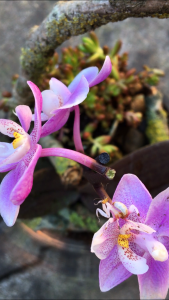 Herberstein; Predatory pollinator deception: Does the orchid mantis resemble a model species?, Current Zoology, Volume 60, Issue 1, 1 February 2014, Pages 90–103.